Lights! Camera! Action! Are you ready for your close up? There's no other bingo site like it. It's none other than Bingo Cams. 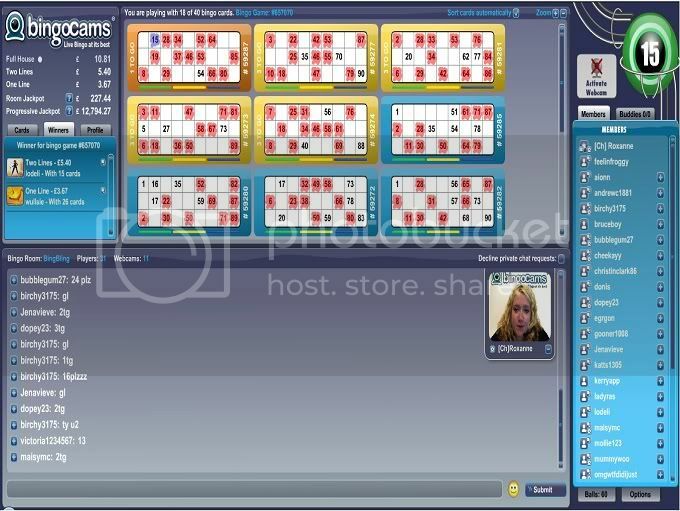 I had bingo on the brain and I always have fun in the Bingo Cams rooms. I told you all about this site before. It's the one with the live win moments. The players and Chat Mods are on live cam. No worries though. You are not required to turn yours on. I joined a room with cards going for 5p each. The prizes were not bad at £3.67 for one line, £5.40 for a double line and £10.81 for the full house. The Room Jackpot was worth £227.44 for a full house within 40 balls or less and the Progressive Jackpot of £12,794.27 is awarded for a full house within 32 calls or less. My Chat Host was Roxanne. There were some issues with her sound at first and she couldn't be heard but that was corrected almost instantly. The room was hopping with 31 players and I was getting anxious for the game to start. As usual, the game flew by. I was getting within 1-2 numbers but someone always seemed to beat me to it. The full house was fast approaching and I had one card that brought me close. I was waiting on 54. The full house prize was ripped out from under me. Luckily it was someone with their cam on. I get such a kick out of the players expressing their excitement when they win. Losing is almost worth it. Almost. Come and socialize and experience bingo at its finest.